Modern Douglas Tartan Ribbon is produced exclusively for us and is one of the most popular tartan ribbons. Modern Douglas Tartan Ribbon is available to buy in 7mm, 10mm, 16mm and 25mm widths, on full 25 metre (approx 27½ yards) reels. The Modern Douglas Tartan Ribbon sold by tartan-ribbon.com is top quality, authentic Scottish tartan ribbon as certified by the Scottish Tartans Authority.The Modern Douglas Tartan Ribbon has a dark blue and green undercheck, based on the Government tartan (The Black Watch) and common to most military tartans, with a white overcheck. Ancient Douglas Tartan Ribbon (brighter blue) is also available if you prefer. The Modern Douglas Tartan is as worn by the Cameronians (Scottish Rifles), the famous Scottish lowland regiment who can trace their history from the days of the Covenanters in 1689 until their disbandment in 1968. 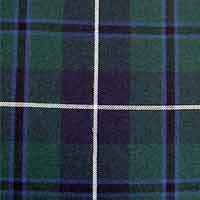 As a lowland regiment, the Cameronians wore tartan trews (trousers) and not the highland kilt.